To combine the efforts and skills of investigators from four different paranormal groups to investigate and hopefully record alleged paranormal activity. 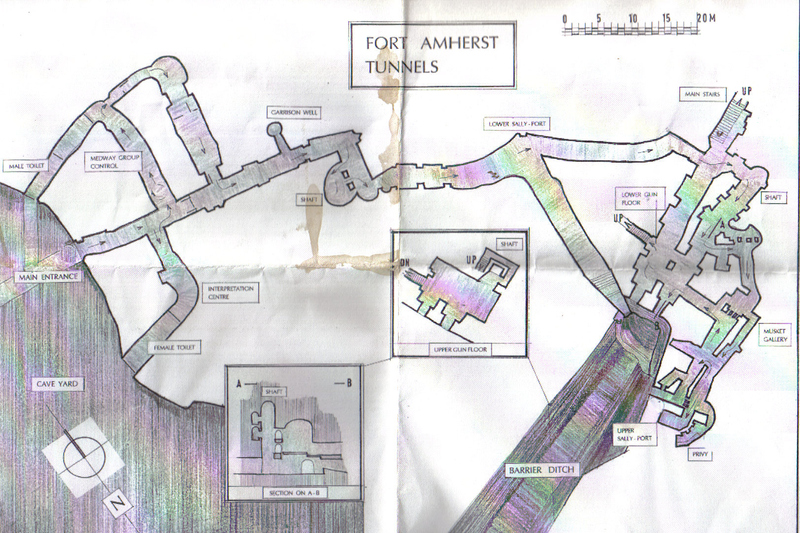 Fort Amherst is arguably the most impressive surviving fortification in the Medway area. It was not built as a separate fortification but more so as an additional part of what developed into The Chatham Lines, a continuous line of defences that surrounded the dockyards. This work was commenced in 1756 and was completed in the form you can see today in 1820. It is widely thought that without Fort Amherst there would have been no need to build the barracks and subsequently the Royal Engineers may not have moved to Chatham, meaning that the Medway Towns would not have had a military history. Amherst is the only surviving Napoleonic Fortress in the country long outliving it's sister fortresses in the Medway Towns being Fort Clarence and Fort Pitt. Like most English forts Amherst never saw any action against the enemy and since the end of the 19th century it had been left, neglected apart from brief periods of use during the two world wars. During WWI the fort was used to house troops and stores destined for the war in France. A large dugout was built under one of the bastions that could hold 3000. These six chambers have since been lost owing to the ditch they were in being filled in. During the WWII anti - aircraft guns were placed on strategic points along The Chatham Lines as well as mortar positions, a 4 inch gun and a 6 pounder anti-tank gun above the sally-port at Amherst. The Kent County Council Civil Defence Corps lined out the tunnels into offices, telephone exchange and accommodation as well as air systems in the event of a gas attack, and were used as their Medway headquarters. These continued to be used for Civil Defence activities until the mid 1950's. The Amherst tunnels are the most striking thing about the fort and run for nearly half a mile from the entrance in the Cave Yard. The tunnels are for most of their length made from existing natural caves and tunnels that were greatly expanded with other parts cut out from the chalk. There have been free standing brick arches used periodically to add support. There have been schemes to restore the fort during the 1970's but unfortunately these plans did not come to fruition. 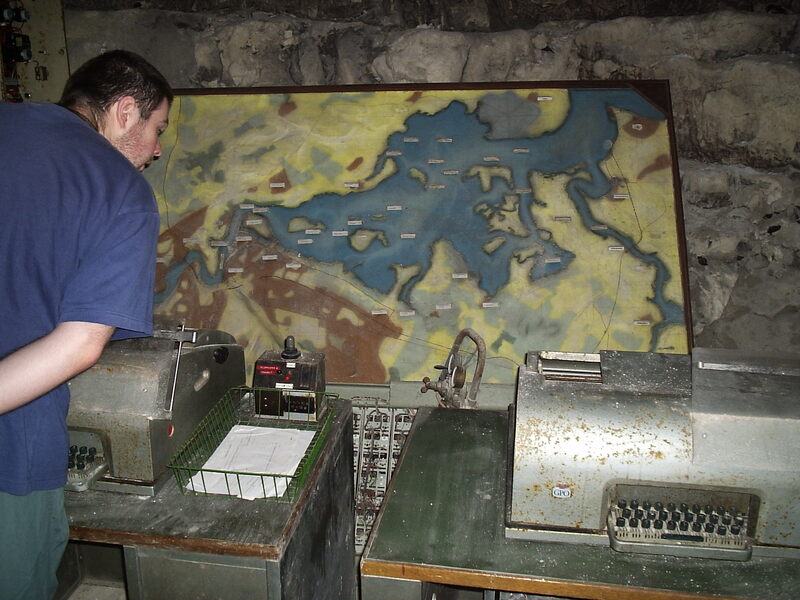 The Fort Amherst and Lines Trust was formed in 1981 to raise money to buy and restore the fort to the same condition it would have been in it's heyday in 1815 and has since restored many areas and created a military museum complex that attracts many visitors each year. And what of their potential for paranormal activity? There have been stories come from the tunnels of happenings and encounters and there has been a previous investigation carried out by another group. The report from this previous investigation was only known to one of us as they had been there at the time, the rest of us did not know any previous results so were looking forward to finding these out for ourselves. The attending groups were going to try to combine they're different skills in both the spiritual and scientific methods of investigating the paranormal. We were to try splitting up into our separate groups for some of the night as well as combining into one large group for other parts, giving us all time to try our own methods as well as experiment with those of others. Ghost Connections were the attending scientific investigators, and for our part we were to try EVP experiments, recording digitally while calling for direct communication with spirit, asking a specific set of questions hoping to record a reply. These sessions were to be recorded on camcorder, photographed and recorded on digital voice recorder. Our other function for the night was to join in some spiritual experiments with the others and record these sessions again photographically and on camcorder. After arriving and meeting the others and settling in to base camp we decided to start the night by splitting into our respective groups, this is an account of our investigations and experiments. We started at 8.20 in the WWII section, the telephony room, where we ran through an EVP experiment as previously explained. As we started some of C.O.T.C. appeared in the next room, the plotting room, and left again. We continued the session the questions we asked were punctuated by a few clicks or taps heard from the room behind us in the plotting room. These were investigated but no cause could be found. Also at 5:10 into the video footage a faint floating object is seen moving left to right across the bottom of the screen, this seems odd as we were filming in normal light without night vision, which is when you would normally pick up dust and other floating particles. The temperature remained 14.6 degrees throughout. We ended the session at 8.40 and moved on to the infirmary. At 8.50 we ran the same experiment in the infirmary, temperature was 15.2 degrees. Some footsteps were heard and some taps that came from the telephony room we were just in, Paddy investigated these and found the venue managers in there which explained the noises. At 8.54 the temperature had dropped to 14.8 degrees. Nothing else happened or was captured on video or still shots and the second session ended at 9.05. We moved on the ammunition shaft. At 9.15 in the ammunition shaft adjacent to the main tunnel we started to run through the experiment again. This was suspended at 9.20 when we were interrupted by two members of C.O.T.C. walking along the main tunnel past us. We continued at 9.25 still hearing coughs and voices from the others so stopped the experiment at 9.30 and moved on to the sally port. Whilst moving to the next location Ian turned to Dave and asked if he said something, he hadn't, but Ian thought he had heard someone saying "huh" and thought Dave had been trying to get his attention, no explanation could be found for this? From 9.30 to 9.40 at the sally port we attempted a fourth run of the same experiment but this was difficult as we could constantly hear voices from the other group and some that again passed us by so this session was abandoned. After a break at 10.30 we moved up to the upper gun room where we decided to sit and try a spiritual experiment. Paddy filmed the session whilst Kim, Dave, Rachel, Ian and Sarah sat in a circle. Spirit communication was asked for with no immediately recognizable results, Although during the session some knocks were heard by Ian and Sarah coming from the area of the stairway in the corner as well as a sense of movement or a shuffle on the stairs. We ended this at 11.00 and had a brief break. At 11.25 we sauntered through the tunnels at the rear of the lower gun room. This was more of a ramble through the tunnels although we did stop to call for spirit a couple of times and heard some odd noises which may have been a response, we realised the others had come back to base so returned to discuss the nights events so far. 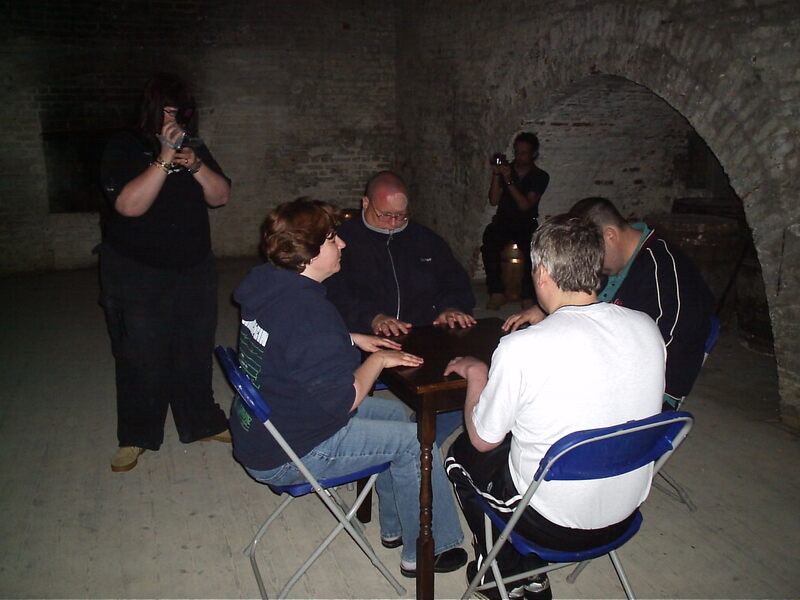 During the break we decided to join together to further investigate the results that C.O.T.C apparently had in the upper gun floor, by using the methods they had used thus far that evening being table tipping and séance. GCUK were going to record the session rather than take part, that is apart from Dave who was keen to join in the séance. This started at 12.40 with a table tipping session with Ian filming under and Kim filming over the table. Being scientific in nature we were keen to ensure that the four people participating placed only their finger tips lightly on the table, although this was not adhered too. It was 12.50 by the time we got started and we finished at 1.00, there was no apparent movement of the table recorded. 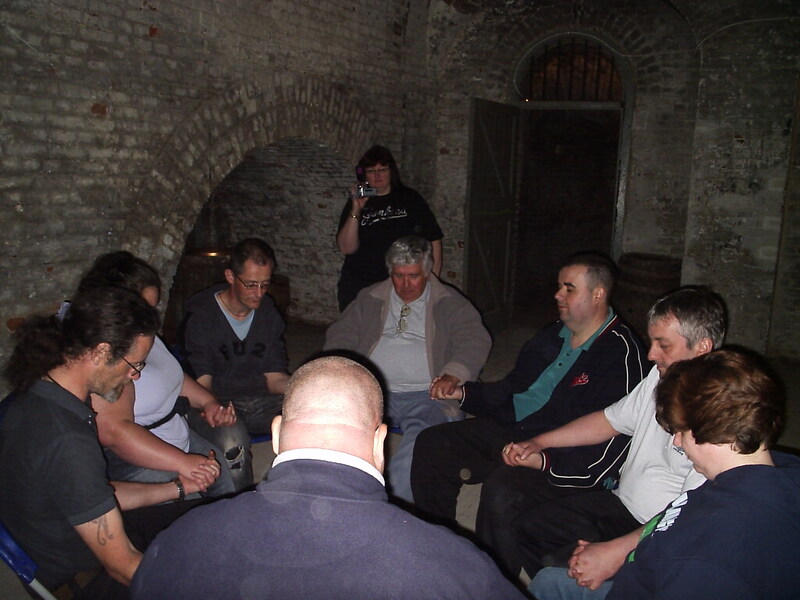 At 1.10 the group formed into a circle to carry out a séance that Dave took part in, this broke for a while at 1.25 and continued at 2.10 until it finally ended at 3.20 with no phenomena recorded. During the later part of the séance Sarah was still transfixed by the staircase in the corner that was bothering her when we were there earlier, only this time she thought she had seen the shadow of an adult and a child walking across an upper part of the staircase that is visible from the gun room. Paddy investigated this but could see no one. Sarah also became short of breath. 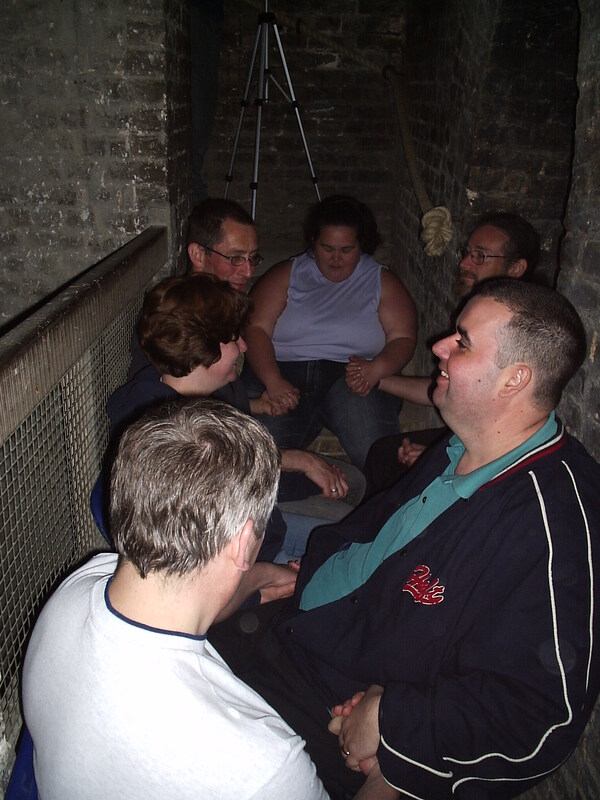 We moved on to that area of the staircase for another séance, which Kim and Dave chose to take part in. During this audible gasps could be heard by all in the circle and by Paddy and Ian who were recording the session. Sandy could also hear them and she was around the corner on the stair case and suggested they were coming from behind her, between her and Ian. Ian investigated but nothing could be heard or seen, although it was very cold? At one moment someone’s radio went off and played “Yankee Doodle Dandy“ when no one had touched a radio, this seemed odd? The session ended at 3.35 when we had a well earned break. We decided to go our separate ways again and we ended up at the top of the stairway from the upper gun floor where we had the last séance, that is apart from Paddy who was keen to see more of what C.O.T.C. were doing, and Rachel who had gone outside. That left Ian, Kim, Dave and Sarah on the stairs from 4.20 onwards, we decided to simply sit and have some quiet time, which didn't end up being that quiet, as by that time tiredness took a hold one hilarious comment proved too much to take! We decided that the end of the night had come so returned to base camp, after discussions about the night with the others we ended the investigation at 5.00 and bid farewell to our hosts. Regrettably our efforts were not well rewarded and we did not experience any paranormal phenomena on the night, neither did we manage to capture any scientific evidence on camcorder, photographically or with our EVP experiments. 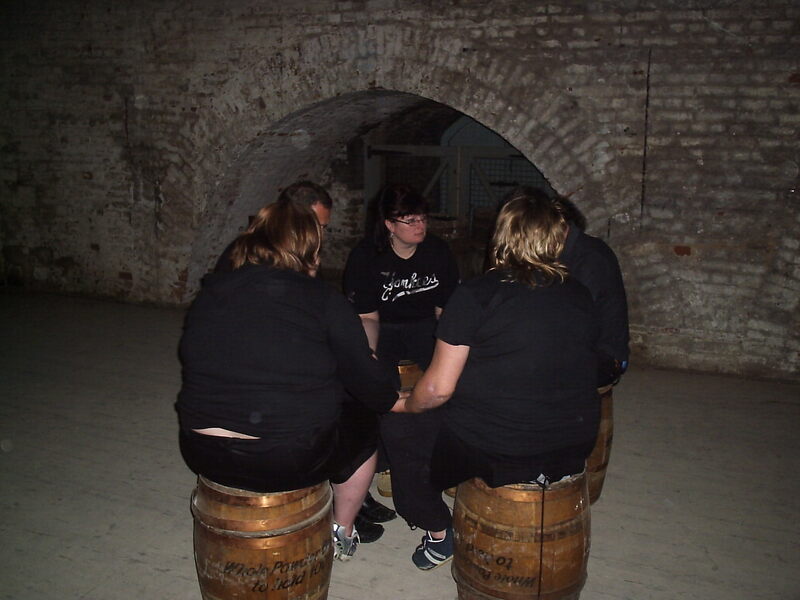 The first part of our night while we conducted our EVP experiments proved to be the most interesting, and there were other moments where you had to wonder if we were alone or not. But sadly apart from those moments it was a difficult night as noise did carry very easily and it was hard to work an area without being able to hear others, especially when they were walking around the complex. 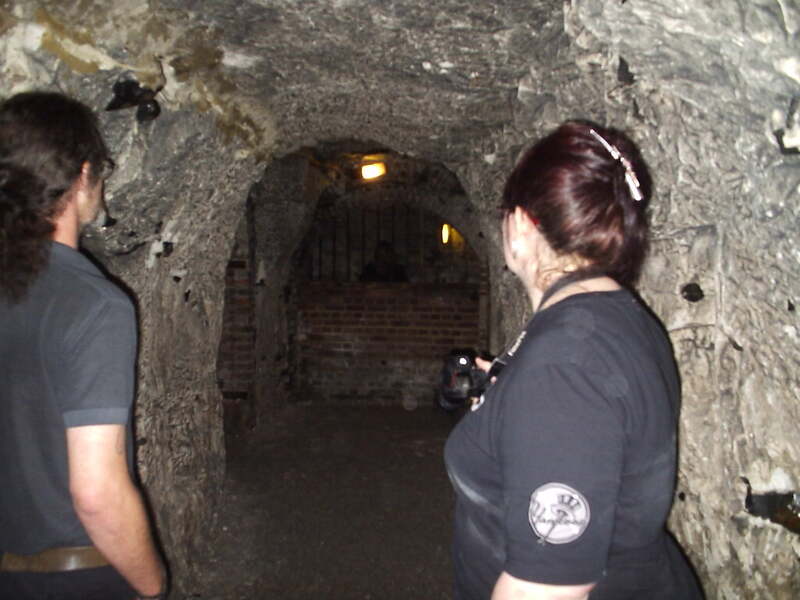 This, however, does not detract from the fact that on the whole we enjoyed the nights investigation and found Fort Amherst to be a fascinating place that we would very much like to return too. There was a degree of information forthcoming of a clairvoyant/psychic kind during the spiritual experiment we undertook as well as some interesting instances during the spiritual experiments conducted with the others, these may have been clairvoyant in nature but this cannot be validated. As Ghost Connections conducts scientifically based investigations we do not publish any psychic or clairvoyant observations. However, this information is held on a separate database. Should you wish to see this information please email us at enquiries@ghostconnections.com. Although this information cannot be treated as evidence it at least gives food for thought. Is Fort Amherst haunted? First impressions based on the factual evidence collected that night suggest not. This is a fascinating place with some wonderful tales to tell and there is no doubt that there are secrets here waiting to be unlocked. But this was only one night out of 365 and if there are occurrences here why would they chose to repeat themselves or show themselves specifically on the night we were there? It's a chance you have to take when you conduct paranormal investigations, and for the majority of the investigations you might do you will find that nothing happens at all, but you keep going for that one night where it all starts to happen. Which is why we shall be trying to make arrangements to return to Fort Amherst as it is GCUK policy to return to previously investigated venues for this very reason. Once again many thanks to the members of C.O.T.C for inviting us to join them on this investigation, and for the management of Fort Amherst for letting investigate this wonderful piece of history.